'Duende," Ellipsis Arts' fifth collection of world music, is a comprehensive look at flamenco, Spain's most famous indigenous music. This set is divided into three parts: Passion, Magic and Exploration. The first disc, Passion, looks at the vocal traditions of flamenco; Magic, the guitar artistry; and the last disc looks at those young flamenco artists who combine the music's traditions with other, more mainstream styles  mixing flamenco and rock, for instance, or flamenco and jazz. 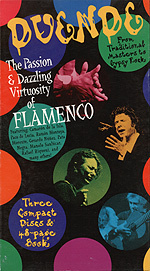 The 48-page booklet accompanying this set features a biography of each artist, an explanation of the different schools or styles within flamenco (much as American blues has delta, Chicago and Piedmont styles). As with all Ellipsis Arts collections, the photography is large and stunning, bringing a visual element to one's understanding of the music. Outside of guitarist Paco de Lucia  the most famous of all living flamenco artists and well-known in American jazz circles for his collaborations with John McLaughlin and Al di Meola  most of the artists here will be unfamiliar to most U.S. listeners. No matter. The quality of the music is so high that each new artist stands out as a new discovery in one's cultural map of the planet.